Avery Compact Trimmer A3 A3CT Pack of 1 Avery Compact Trimmer - A3CT. Manufactured from aluminium making this a strong, lightweight trimmer that can be stored easily. 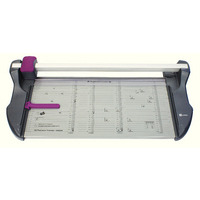 Other features include clear markings ensuring precise paper alignment. Cuts paper up to A3 size. Colour - Aluminium and Blue. 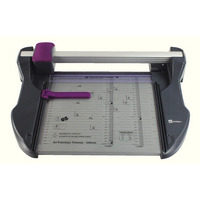 Avery A4 Photo and Paper Trimmer TR002 Pack of 1 A4 photo/paper trimmer designed for home and office trimming of digital photos and paper. Guidelines on baseboard makes cutting photos to standard sizes quick and easy. Capacity 5 sheets. 305mm cutting length. 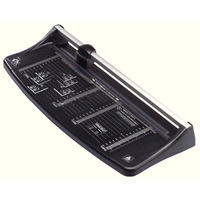 Avery Precision A4 Trimmer 30 Sheet Capacity P340 Pack of 1 A4 Rotary trimmer with the safety of an enclosed cutter head, self-sharpening steel rotary blade and steel baseboard with comprehensive metric and imperial scales that includes paper size indicators for quick alignment of papers. Capacity - 29 sheets. Avery Precision A3 Trimmer 30 Sheet Capacity P460 Pack of 1 A3 Rotary Trimmer with the safety of an enclosed cutter head, self-sharpening steel rotary blade and steel baseboard with comprehensive metric and imperial scales that includes paper size indicators for quick alignment of papers. Capacity - 30 sheets. 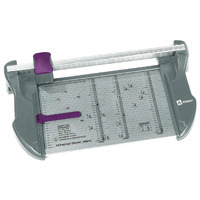 Avery Precision A2 Trimmer 30 Sheet Capacity P640 Pack of 1 A2 Rotary trimmer with the safety of an enclosed cutter head, self-sharpening steel rotary blade and steel baseboard with comprehensive metric and imperial scales that includes paper size indicators for quick alignment of papers. Capacity - 30 sheets.